It's LeMons Über Gallery time again! 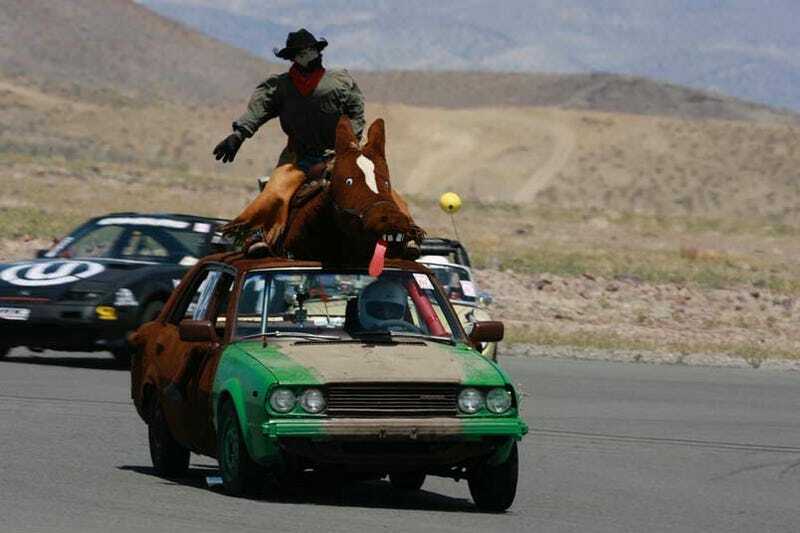 We got a lot of photographic help at the 24 Hours Of LeMons Goin' For Broken at Reno-Fernley Raceway, so plenty of parts-sheddin' action was captured on film. We're breaking up the galleries by photographer this time, because a couple of the cameramen were pros wielding monster lenses, and they're offering high-quality prints for sale. Thanks to Mad_Science, Mad_Science Senior, Jaff Balliet, Nick Pon, LTDScott, and Head-On Photos for the photos! Need to peruse Über Galleries of past races? Check out the LeMons South Spring '09 Über Gallery, the the Gator-O-Rama LeMons '09 Über Gallery, the Arse Freeze-A-Palooza LeMons '08 Über Gallery, the LeMons Yeehaw It's Texas '08 Über Gallery, LeMons Detroit-ish '08 Über Gallery, LeMons New England '08 Über Gallery, LeMons South '08 Über Gallery, LeMons San Francisco '08 Über Gallery, LeMons Arse Freeze-A-Palooza '07 Über Gallery, and the LeMons San Francisco '07 Über Gallery. Head-On Photos got some beautiful shots of the Goin' For Broken cars in action, and here's a sampling in the next couple of galleries. They've got plenty more LeMons photos at their website, and they'll sell you a mounted print of any of them. Next up are some of the photos shot by Jeff Balliet of ASK Photography. If you'd like prints or DVDs of these shots in their original resolution, email Jeff.